It has become apparent to me recently why ‘child friendly Advent calendars’ were invented. It was to assist parent conversations with time conscious, anxious seven year olds. In a Christmas nutshell; it was to avoid the parent in question, doing their nut and rocking in a corner with their thumb tucked safely in their mouth. Kid 2, in his hyper awareness of the universe and it’s going ons, likes to know exactly what we are doing and when, what time it is, how many days until…..I mean it folks. He wants to know the answer to these questions, more than once a day. It is because of this calendar that, when faced with a constant barrage of Christmas time questions, I can present a patient, non-yelling like a deranged banshee parental face. This mummy can now rest safely at night, knowing that the authorities will not be knocking on the door anytime soon. I blathered on about what shortbread means to me last year. In short, Christmas is shortbread and shortbread is Christmas. Up to today, this Cheergerm has baked good old fashioned shortbread, gluten free shortbread and chocolate ginger shortbread. (Hmm, I see a pattern.) 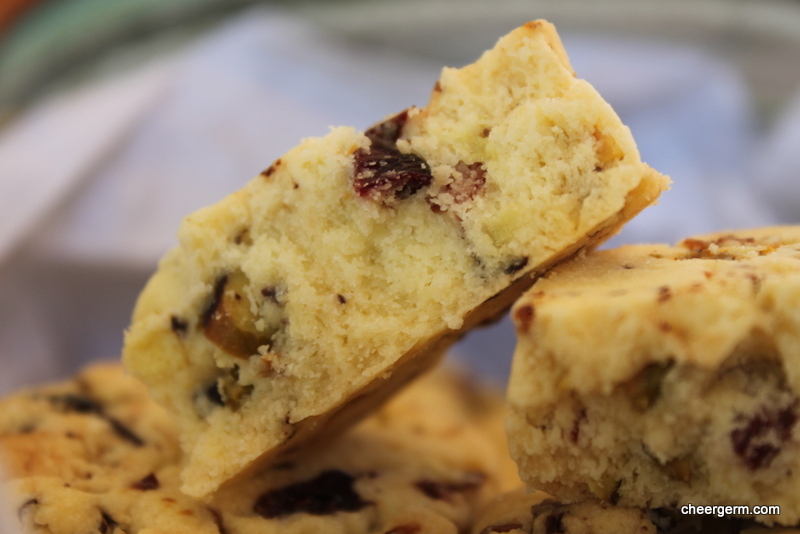 Now I present to you a very grown up chocolate, pistachio and cranberry shortbread. 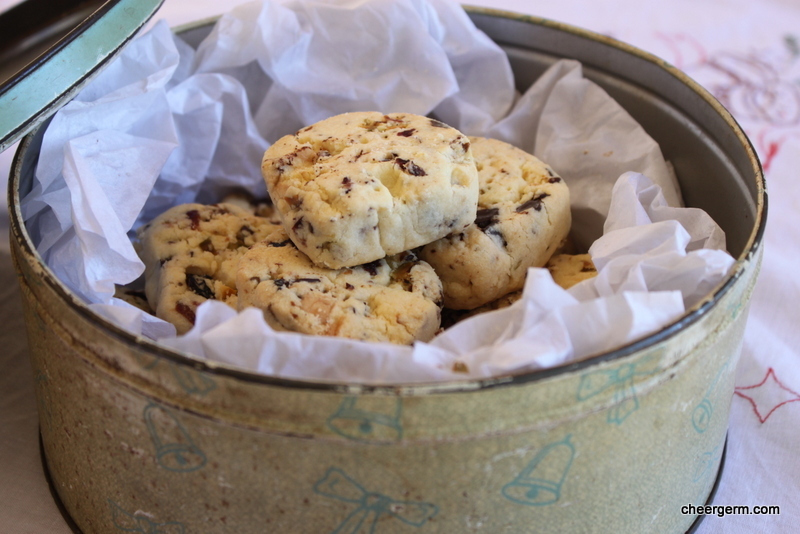 The buttery goodness of this biscuit mixed with tart berries, rich dark chocolate and a nutty crunch, is a festive delight and a wonderful Christmas edible gift. To top it off, this recipe can easily be made gluten free or not. 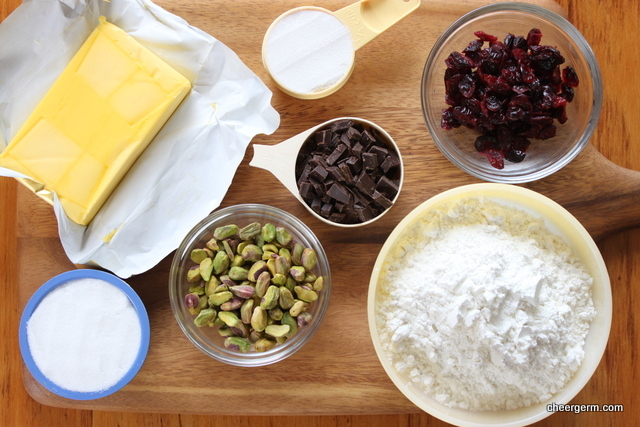 The flour is a straight swap, just make sure you use a good quality gluten free flour blend. It’s not so bad being a grown up if you get to eat biscuits such as these. Even if you do get asked the time and date more than one very human being ever should be. 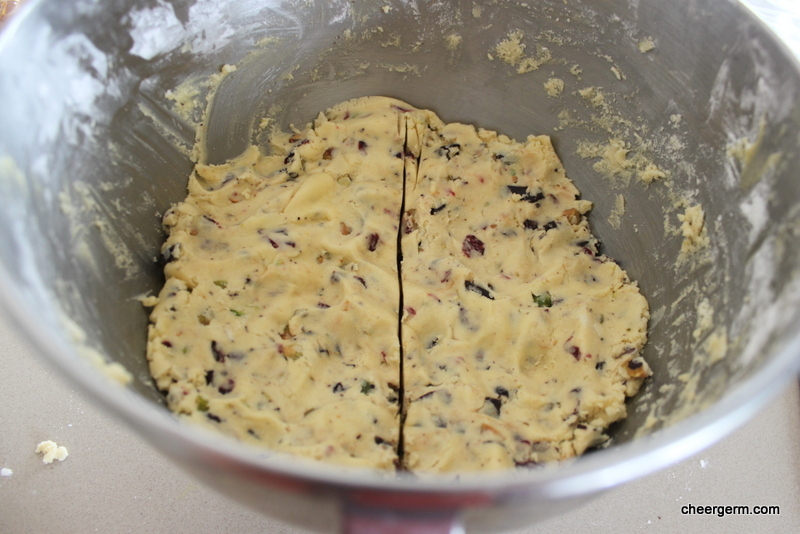 Add the pistachios, cranberries and chocolate and knead lightly to bring together to a dough. (I do this in the bowl.) Knead a little longer for a regular version. Slice the logs into 1-2 cm thickness, depending on your fancy, place 10mm apart on a baking tray and prick each piece all over with a fork. This mixture was a bugger to cut due to the chocolate and nuts, so the colder the better. Some shortbread may go out of shape but just form it back into a similar shape using your hands. Cooking Notes: When adding the flour to the mixture, I pop a teatowel over the mixer to stop the flour ‘floofling’ (an exact culinary term) all over the joint. This entry was posted in Christmas, Gluten free baking and desserts, Old school baking and tagged baking, cheergerm, Christmas shortbread, cranberry chocolate pistachio shortbread, food, gluten free, gluten free shortbread, recipes, Shortbread. Bookmark the permalink. These look amazing! Nothing like shortbread that says Christmas. My mom’s secret shortbread ingredient was rice flour, too. Thanks Mrs France! How cool that your mum used rice flour too, gives it that special ‘shortbready’ bite hey? Thanks, festive wishes to you too. 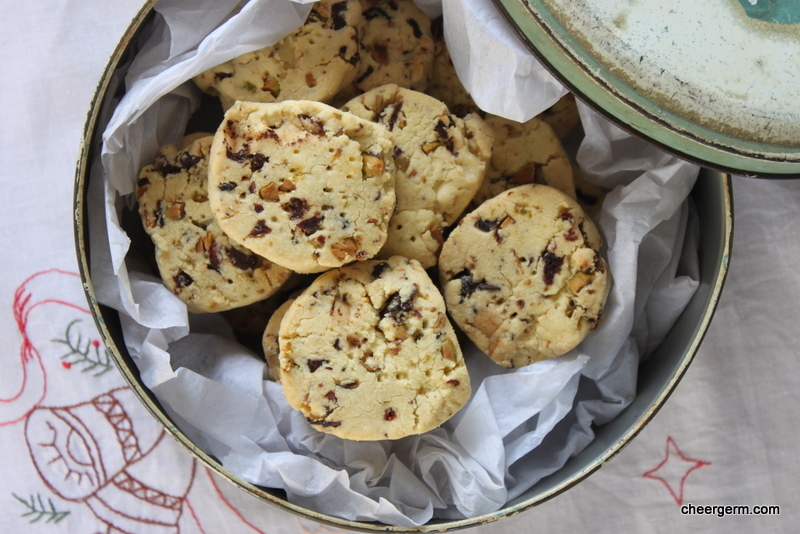 Your cranberry chocolate pistachio shortbread is irresistible. I would add here white chocolates instead. 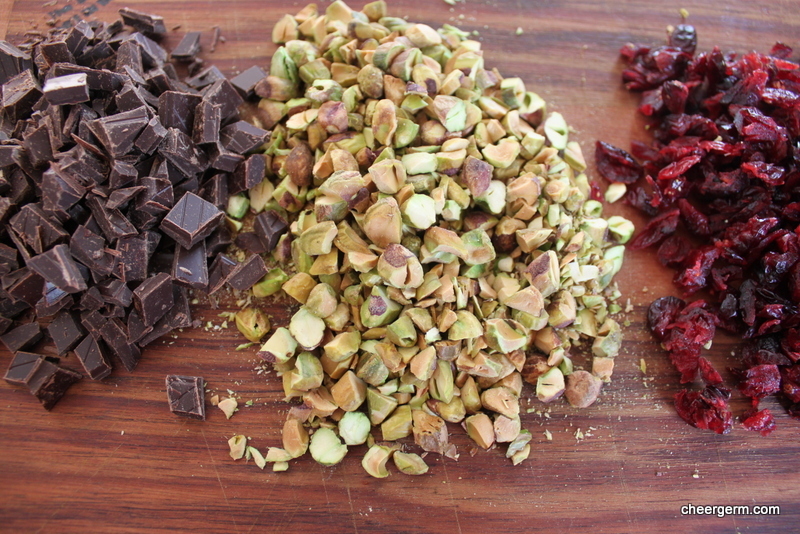 Cranberries + pistachios = win! These biscuits look delicious! Timely post Cheery. I made GF shortbread during the week and the texture was blah! We ended up chucking them! I’ll give these a whirl during the week. I use a tea towel for floofle control,too! I do love a good shortbread! And, despite the fact that the KID in our house is now an adult, we still have numerous advent calendars – both physical paper ones and electronic. They do help with those pesky questions! Me too KW, especially with a good strong cuppa. They are a blessing indeed those advent calendars. How sweet you still have them despite the grown up sproglets I too cannot image a Christmas household without one now. I have an older friend who still sends them to her 40+ year old children (and those children’s children). You are never too old for advent calendars! What a lovely thing to do. We had them growing up but there were some ‘adventless calendar’ days in between then and having children I must say. I love it, love it, love it! Thank you Cheergerm! Oh my they are so seriously delicious looking! Inspired combo with the cranberries. My son hides his advent calendar in the fridge from his brother, then forgets it’s in there! Thanks Mrs S! They are super yum. (Not helping my ice-cream pants much, cest la vie!) How cute that he hides it then forgets it! It must have chocolates in it!? Yes, it was extremely trying. I forced myself to dole out the sugar using a teaspoon! Okay, I’ve got this weird, wonky quirk which I absolutely have to discard. I only eat shortbread when I’m in Scotland. Like you, it has a very precise meaning attached to it. It’s not that I’m not tempted to eat it 365 days of the year, but it’s because I’m tempted to eat it 365 days of the year that I hold off. I’ve found that it is the food embodiment of an afternoon in the highlands. Which of course must be followed by haggis and whisky. It all gets shoved in there. That sweetchops and very squishable excitement does keep the joy in this festive season, I know I too will miss it when it’s gone. That is a pretty fabulous quirk as I never, well rarely, make shortbread the rest of the year. You evoked the idea of Scotland beautifully in that wee paragraph lass. Far be it from me to judge when and where a body chooses to indulge in this wonderul buttery treat. If only in the company of mermaids, in the halls of the Gods, whilst wearing a wooly beanie, then so be it!! Of course, you could make them as gifts but not eat them…..? Hello, hello, are you still there Mrs P? In the company of mermaids–check–although they’d need to be selkies. In the halls of the Gods–check–aren’t all men in kilts just that? And whilst wearing a wooly beanie–okay, fine. I’ll look like a dufus, but yes, I’d do it. You’ve just made me miss Scotland more. And I thought it was IMPLIED that no one in their right mind could make them and give them without eating half the goods. Yes, I’ll be a building with feet. But a happy one. I shall try your newest recipe. All the others turn out brilliantly. You crack me up Mrs P! On the subject of crack and all things related. (Except for the not so great word association of scary illicit drugs), I can envisage you dipping your shortbread in some of this. A great use of some of your gorgeous malt whiskey!? Oh! I adore Cranachan. And this new recipe might be something I try for Burns Nite in January. But no, I’ll not put the gorgeous malt in it, only the sad remnants of a blend someone had the audacity to cross my threshold holding onto and leaving on my counter. Can’t account for taste these days. Assume some of these are on the Christmas eve table????? Fear not great one, you may even receive a personal package of one, two or perhaps even three? Hmmm, these look so decadent- I might make the old school version with these additions. They are indeed decadent Mrs I! (Those darned pistachios aren’t the cheapest..he he…) I am about to make an old school batch now too, the shortbread production line continues. 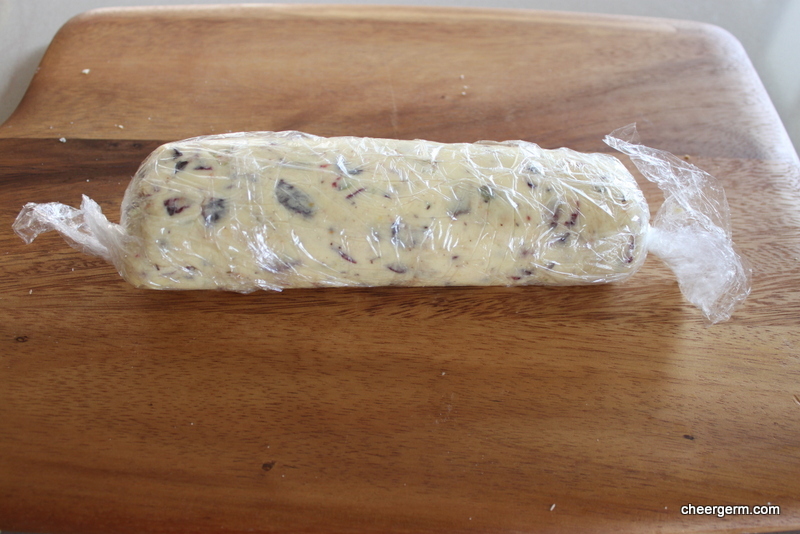 This short bread is another thing I shall be making! Yes, now we are all on the same Christmas page and confusion will be avoided. 😁 I would be chuffed if you gave it a whirl Shirl. It’s very festive it is. Cheers Mr Food!! But these pictures though… Wow wee Mrs Cheergerm! I gained a pound just slobbering on the pics. Thanks a lot, cheery. Not generally a fan of shortbread. I have tins of them taking up room in the pantry. This chocolate and cranberry version sounds more up my ally. This is a bit of a more grown up version, you may (or not) like it! Yes Virginia….we are almost there, tee hee. PS, are we THERE YET, MUM? I was enjoying the cheery tale, identifying and remember and all that, then got to the recipe and my bowels melted with lust wanting the shortbread with all my stomach but knowing it was not meant to be cuz it wasn’t gluten free but tortured myself anyway reading the ingredient list when what to my wondering eyes did I see? Holy Christmas, ’twas GLUTEN free. Thank you. Thank you. Thank you. And merry Christmas to you. How many sleeps left? Hello! Super glad that you were not left with a sad well of burning disappointment. Yes Virginia, there is a Santa Claus! Thanks for stopping by and I hope you get to make these at some point as they are delicious, i made a batch yesterday and have one more to do today. How many sleeps? I have to go check the advent calendar…he he…Merry Christmas! Lots of people when they read food blogs say “I’m going to try that recipe” and of course they never do . Matthew W of the tremendous moustache, I do agree with your moustachioed self that many times we may think we are going to try something, I have a list that I am slowly slogging my way through. I think these will still be ‘totes delish’ without the chockie.